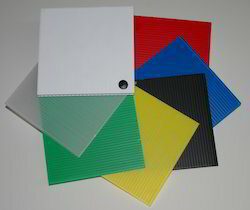 PP Corrugated Sheets are Hollow Polypropylene Sheets primarily used for signage, floor protection & low cost roofing. These sheets come primarily in three colours white, black, grey & yellow but, can me manufactured in other colours like Blue, Green, Red etc. The standard thickiness is 2 mm to 8 mm & standard sizes are 4 ft x 6 ft, 51" x 78" & 4ft x 8ft. 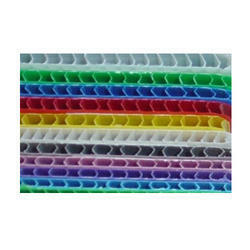 Keeping in mind the diverse requirements of our clients we are involved in offering an extensive range of Polypropylene Corona Treated Sheet. Our quality controllers ensure their quality by testing them on various parameters to render maximum client satisfaction. Offered products are highly reckoned among our clients due to their excellent quality and wear and tear resistance in nature. 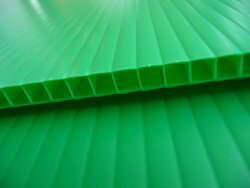 Being the leading names in industry we are into offering a quality approved range of Polypropylene Corrugated Board. 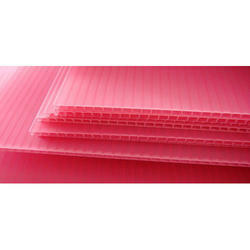 PP corrugated sheet manufactured by us are specialty formulated extruded plastic sheets that are developed especially for glow sign. These are used in indoor/outdoor signage & advertising danglers. Colors : Yellow / White / Blue / Gray / Red / Black / Orange and more. 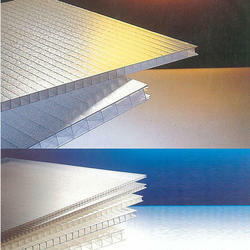 PP Hollow Corrugated Sheets made from impact co-polymer of polypropylene. It is an extruded - hollow profile consisting of two flat walls connected by vertical ribs. These Hollow Sheets generally used in Advertising, Packaging Material Handling & Protection, Stationery, Construction & Interiors. Being a client centric firm we are into offering an exclusive range of Polypropylene Corrugated Sheets. 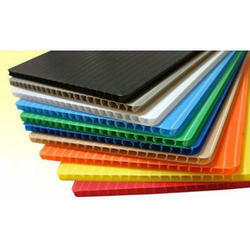 These are commonly known as PP flute board and are highly reliable in nature. Offered sheets are widely used for various applications such as Screen printing, mounting boards, floor guard, advertising danglers, POP display boards, signage, movie display stands and much more. Being one of the pioneers of PP Corrugated Sheets in India we have evolved from simple hollow sheets to various thickness and types of these sheets. We supply all over India and our sheets are known for their impeccable quality. Our products are available at competitive prices in the market. Being the leading names in industry we are involved in offering a wide assortment of Flute Board. These are extensively used for screen printing, advertisement printing and many more. 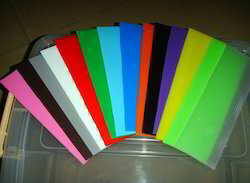 Offered products are available in thickness, colours and sizes as per the requirements of our customers. Moreover, we assure our clients to deliver these products in given period of time. Color White, Yellow, Grey, Blue and much more. 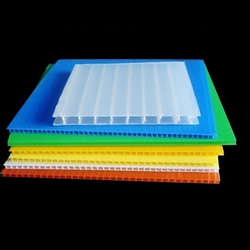 Theese high quality PP Flute Boards are manufactured and imported by us is available in a variety of colors like grey, green, red, black, yellow, white, blue & orange. 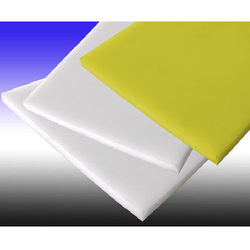 Our sheets are applicable in industries like advertising, packaging and construction. These PP Flute Boards are manufactured in various lengths, thickness, widths and colors to optimize the customers' satisfaction level. 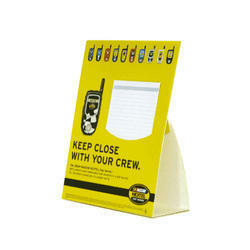 Our assortment of boards are Eco friendly, recyclable, printable and chemical inert. 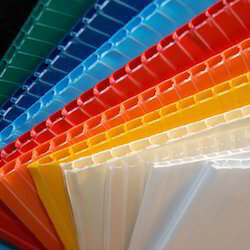 Keeping in mind the diverse requirement of the clients, we offer our clients wide range of Plastic Corrugated Sheets. These are manufactured using best quality raw material which is procured from certified vendors of the market. We offer these in different sizes and thickness as per the clients requirements. In addition to this, we offer our products in market at feasible prices. 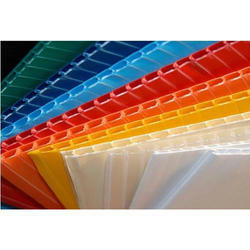 For the diverse requirements of our clients, we are involved in offering a wide assortment of Plastic Sunpack Sheets. These are manufactured by our trusted vendors using fine quality material and sophisticated technology. These are available in various specifications as per the requirements of our clients. Additionally, these are available in market at economical prices. Color Blue, White, Red, Yellow and much more. 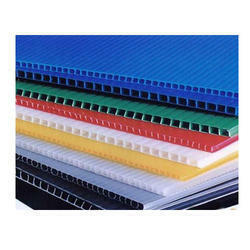 Owing to years of experience in the industry, we offer our clients a wide range of Polypropylene Flute Board. We are the first and currently the largest distributors of Sunpack PP Sheets manufactured by Caprihans pvt. ltd. These are the best quality PP Flute boards available in the market. Our products are reliable and long lasting. These sheets can be availed in market at industry leading prices. 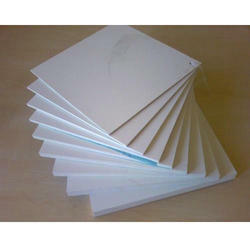 Polypropylene Sheets are known for excellent printing surface. 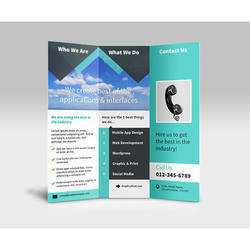 These sheets are used for advertisement dangler printing and board printing. These sheets are light weight, strong and cost effective making it ideal choice for low cost advertisement. These sheets can be availed at competitive prices. Keeping in mind the diverse requirements of the client, we offer our clients a wide range of Polypropylene Printing Sheets. 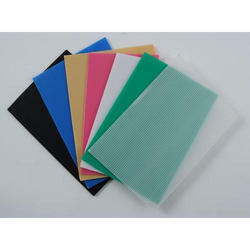 Offered Polypropylene Printing Sheets are extensively used for Offset printing and screen printing for advertisement display boards, POP display boards, danglers and many more. Additionally, we offer our products at very economical prices. Looking for PP Corrugated Sheets ?